ABS-CBN is set to suspend Korina Sanchez and her Sunday show, “Rated K” for featuring James Yap and his pregnant girlfriend, Michela Cazzola. This is the apparent immediate action made by the Kapamilya network after Kris criticized Korina, shortly after the James Yap feature at Rated K was aired last Sunday, April 22. “Handa na ba kayo? Sususpindihin ng ABS-CBN si Korina pati ang kanyang Rated K, sabi ng bes ko na nagwo-work sa opis mismo ng Kapamilya. Kumalat daw agad ito kasi nga napikon si Ms. Kris sa pag-feature ng Rated K kay James Yap at sa jontis nyang dyowa. Wait na lang tayo sa official announcement ha?” A netizen wrote on Facebook. “Para sakin, mali naman tlg yun, lalo na at besfren sila Kris at Korina dati. Sana, nagpaalam muna siya dun sa tao, respeto kumbaga! Di tuloy napigil ni Kris na maidamay ang politika. Sabagay, tama naman siya, alam naman natin tlg kung bat nanalo si PRRD!” The netizen added, whose identity was covered for her protection. The said post is now going viral on social media, but we could not find the netizen who first posted it. 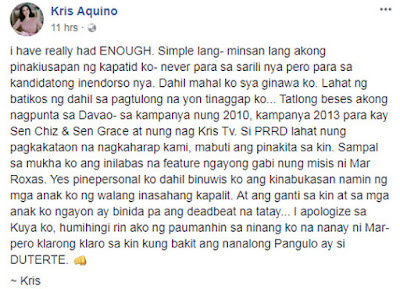 What we know is Kris already apologized to her brother, former President Benigno “Noynoy” Aquino, former DILG Secretary Mar Roxas, and President Duterte for dragging politics in her rant. Nevertheless, she did not apologize to Korina and ABS-CBN.